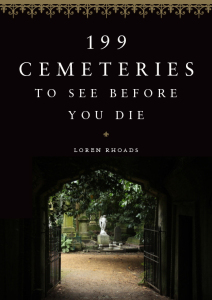 I won 199 Cemeteries to See Before You Die (Black Dog and Leventhal) as a door prize in an online writer’s chatroom when author Loren Rhoads was a guest during Horror Month. I expected a breezy romp through grave sites of noted horror authors, famous murderers and their victims, and creepy cemeteries known for their ghosts and eerie happenings. What I received is an exquisitely executed travel guide that explores the beautiful and often strange ways we choose to honor our dead and preserve our history. In a style that informs without being dry, Rhoads takes us on a respectful tour of monuments to the dead around the globe. Many are historic sites; others are poignant tributes to loved ones. Even famous tombs like the Great Pyramids and the Taj Mahal get a fresh look. From the ancient Kerameikos cemetery in Athens and the rock-cut tombs of Jordan to the Bob Marley mausoleum in Jamaica and the National Aids Memorial in California, each fascinating entry is meticulously researched and accompanied by a high-quality color photograph that makes you want to hop in the car or book a plane ticket and go. This lovely book is one to keep on your coffee table.